Andy Roberts has always enjoyed being a 'Clown on the Road'. 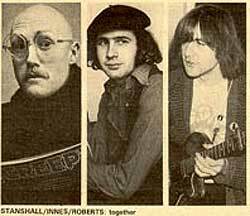 Andy was an integral part of the music with the Scaffold, played the fool and a guitar with GRIMMS, did a bit of Rutling with the lovely Eric Idle and helped Vivian Stanshall into recording mode for the 'Let's Make Up And Be Friendly' album. And Spitting Image, sadly missed from British TV, provided another moment of silliness. The Traverse Theatre in Edinburgh played an extremely important part in the early career of Andy Roberts. "I ran into a guy at a party who was the older brother of the drummer in the band I'd had at school, a chap called Max Stafford-Clark. Max said he was going to Edinburgh to do a play and would I write a tune for it? I was eighteen and kind of drunk or stoned or something and I didn't take it seriously. Then he phoned up and asked where it was and of course I hadn't done anything. So I got his brother John, the drummer, in and wrote this little guitar thing - just electric guitar and drums. Recorded it on a Grundig at home and sent it to Max. He liked it, used it, and phoned me up a couple of weeks later to say this guy who was going to play guitar for a late-night review they were doing couldn't make it and could I come up and write and play the music? I took an electric guitar and an amplifier and John took his drum kit and we went up and played this review, which happened to be at the Traverse Theatre Club. 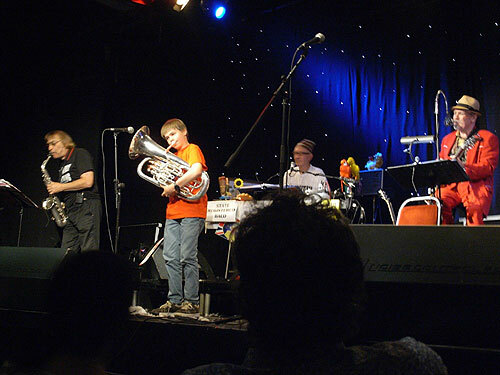 We played for a fortnight, about an hour each night, and after us was Lindsay Kemp with Jack Burkett, The Great Orlando, plus this young student of his called Vivian Stanshall (right), doing mime and playing the tuba and generally camping around. 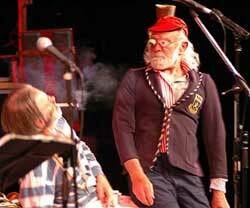 I was sharing a dressing room with Viv, the Bonzo Dog Doo Dah Band had just started and he told me all about that. 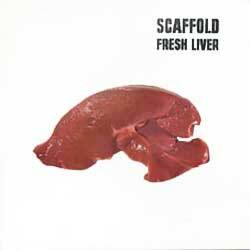 Following us in for the third week of the Festival was this funny theatre team from Liverpool called The Scaffold. I didn't know anything about them. Somebody said oh yes, Paul McCartney's brother. 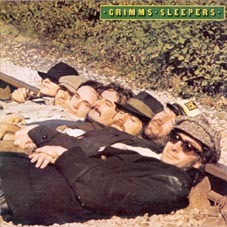 I went to see their show and thought it was wonderful and that's how I met Roger McGough, John Gorman and Mike McGear. With them was all these other people like Pete Brown, Spike Hawkins, Brian Patten, Adrian Henri, all these poets - they were doing a poetry show at The Traverse in the afternoon. "All these people who have remained friends and collaborators were all focused on this one little theatre." 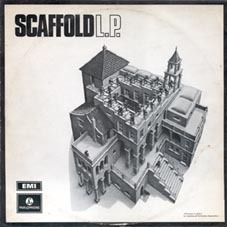 "I was working with The Scaffold as well by then, as a back-up musician and then they started having their hits." '2Days Monday' was the first one that got a sniff, then 'Thank U Very Much' really became huge, and then 'Lily The Pink' which came out of a show I'd worked on. I was there the day Roger said "I've got these words ... it's an old rugger song we used to do". We thrashed it out in John Gorman's flat, I also played on the record. 'Lily The Pink' which came out of a show I'd worked on. "... until I ducked out after 'Lily The Pink' 'cause it was all so big. They were working every night and I was a student, I couldn't do it. " 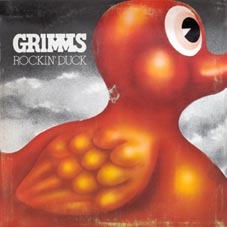 "In 1970 I'd worked with the Bonzo Dog Band for a while as the THE BONZO DOG FREAKS, which was only Viv Stanshall and Neil Innes by then as the others had left, with Ian Wallace and me ..."
"... We had this idea of working together as Grimms, which was Gorman, Roberts, Innes, McGough, McGear, Stanshall." 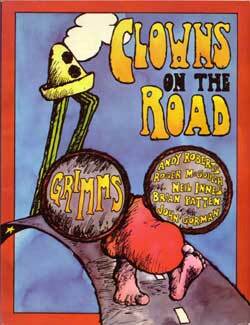 - GRIMMS hits the road. 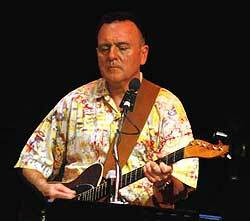 Andy is a founder member, but joined Plainsong around the time of the first album instead. 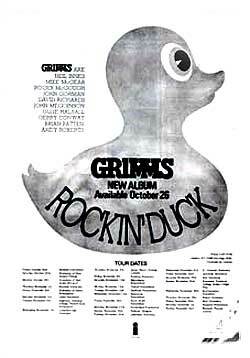 He didn't rejoin until the second tour and album in 1973. 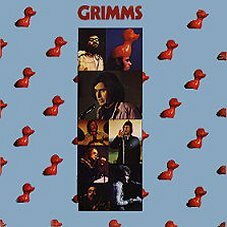 "GRIMMS was started in 1971, when we did two gigs, one at Greenwich Town Hall, with Keith Moon on drums, and one in Corby in Lincolnshire. 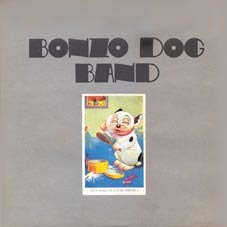 THE BONZO DOG BAND assemble at Richard Branson's new Manor Studios in Oxford. The Bonzos are the first to record there - read more about Vivian in Ginger Geezer, written by Lucian Randell & Chris Welch. 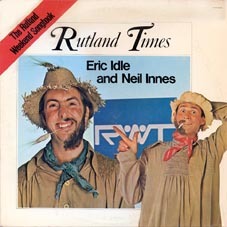 RUTLAND WEEKEND TELEVISION was a wonderful parody of those other Liverpool lads. 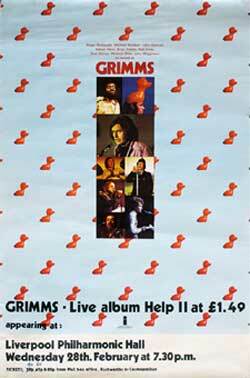 Andy featured in the TV series playing different roles and played on this album with some good friends. SPITTING IMAGE * This satirical puppet programme, broadcast from 1984 until 1996 was created by Peter Fluck and Roger Law. 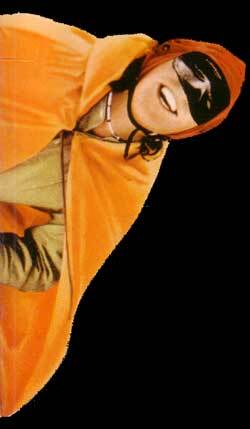 Most programmes ended with a song. 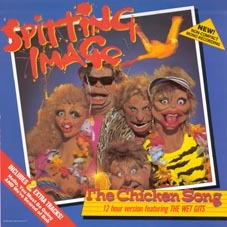 Their Black Lace parody, "The Chicken Song," was Number One in the music charts in 1986, backed with Peter's "I've Never Met a Nice South African". 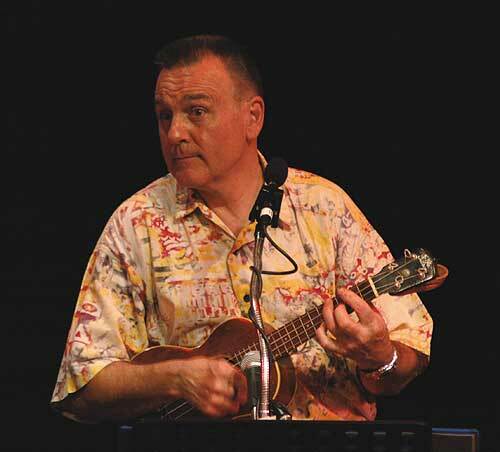 a musical voice alongside Peter Brewis on numerous recordings. 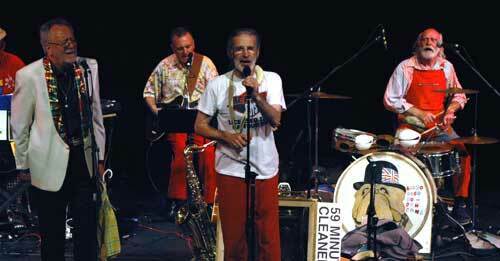 Andy joined up with some of the lads again in 2009 (present) when THREE BONZOS AND A PIANO formed to tour the UK. 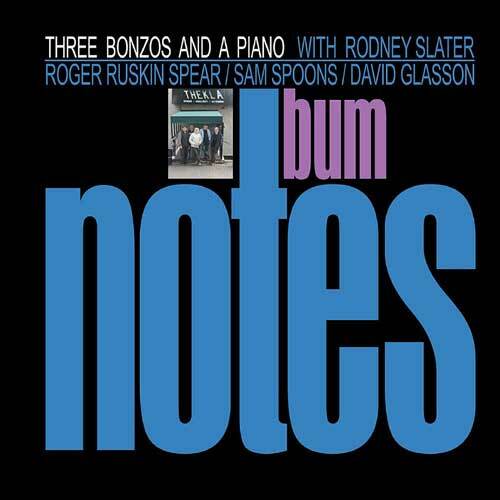 NEW CD: Bum Notes with contributions from Andy Roberts, Mick Hutton and Chris Spedding. 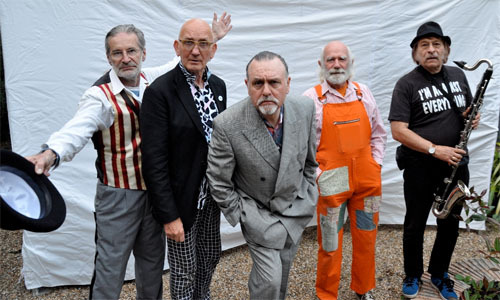 The line was Roger Ruskin Spear, Sam Spoons, Rodney Slater and Dave Glasson, with an occasional 'special guest' which included Legs Larry Smith & Vernon Dudley Bohay Nowell.